The New South Wales election will be held on March 23. Last week, a Newspoll had a 50-50 tie, while a ReachTEL poll gave Labor a 51-49 lead. At the 2015 election, the Coalition won 54 of the 93 seats, Labor 34, the Greens three and independents two. The Coalition won the two party vote by a 54.3-45.7 margin. Since the 2015 election, the Coalition has lost Orange, to the Shooters, Fishers and Farmers, and Wagga Wagga, to an independent at byelections. The Coalition enters this election with 52 seats, and would need to lose six seats to lose its majority. Labor needs to gain 13 seats for an outright majority. If Labor gains ten seats and the Greens hold their three seats, a Labor/Greens government could be formed. On the pendulum, the Coalition holds six seats by 3.2% or less. The current poll swing is about 4.8% to Labor, so Labor would be expected to win these six seats, depriving the Coalition of a majority unless they gain a seat held by a crossbencher. Labor’s difficulty is that the Coalition has no seats held between a 3.2% and a 6.2% margin. On the pendulum, Labor would need a 6.7% swing to gain the ten seats needed for a Labor/Greens majority. This suggests Labor needs to win the two party vote by a 52.4-47.6 margin. The pendulum is a useful tool, but swings are never completely uniform. Owing to random variation in the size of swings, analyst Kevin Bonham expects a seat outcome of about 44 Coalition, 41 Labor, three Greens and five Others on the current polls. One side or the other could get lucky and win more seats than expected. The last NSW statewide polls are a week old now. A key question is whether the final two weeks make a difference. The unpopularity of the federal government could assist state Labor. The Poll Bludger has details of Daily Telegraph YouGov Galaxy seat polls of Goulbourn and Penrith, presumably conducted last week from samples of 530-550. In Goulbourn, there was a 50-50 tie (56.6-43.4 to Liberal in 2015). Primary votes were 38% Liberal, 37% Labor, 8% Shooters, 6% One Nation and 4% Greens. Gladys Berejiklian led Michael Daley as better Premier by 43-30. In Penrith, the Liberals led by 51-49 (56.2-43.8 to Liberal in 2015). Primary votes were 42% Liberal, 38% Labor, 9% One Nation and 6% Greens. Berejiklian led Daley by 51-30 as better Premier. Seat polls have been very unreliable at past elections. The NSW upper house has 42 members, with half up for election every four years. The 21 members are elected using statewide proportional representation. The quota for election is low: just 1/22 of the vote, or 4.55%. NSW uses optional preferential voting for its upper house. A single “1” above the line will only apply to that party’s candidates. Voters may put “2”, “3”, etc above the line for preferences to other parties after their most preferred party is eliminated. To vote below the line, voters must number at least 15 boxes for a formal vote. There is no group ticket voting in NSW. In the current upper house, the Coalition holds 20 of 42 seats, Labor 12, the Greens four, the Shooters and Christian Democrats two each, Animal Justice one and former Green Jeremy Buckingham has the last seat. The seats to be elected in 2019 were last up at the massive Coalition landslide of 2011. Eleven Coalition, five Labor, two Greens and one each for the Christian Democrats, Shooters and Buckingham are up for re-election. As the Coalition will not do as well as in 2011, they are certain to lose seats, and Labor is certain to gain. According to the ABC’s Antony Green, 83% of ballot papers in 2015 were single “1” votes above the line. Owing to the high rate of exhausted preferences, parties with primary votes about 2% win seats. In the four elections since the current system was introduced in 2003, the lowest primary vote to win was Animal Justice in 2015 with just 1.8%, and the highest primary vote to lose was Pauline Hanson in 2011 with 2.4%. As a result of the low quota for election, One Nation’s lead candidate, former federal Labor leader Mark Lathem, is certain of election. The Shooters are also certain to win at least one seat; they are assisted by drawing the left-most column on the ballot paper. Various left and right-wing micro parties could be fighting it out for the last seats. A year after the March 2018 South Australian election, we have our first SA state poll. In this YouGov Galaxy poll for The Sunday Mail, conducted March 12-14 from a sample of 844, the Liberals led by 52-48 (51.9-48.1 at the election). On primary votes, both major parties are up at the expense of SA Best. Primary votes were 42% Liberals (38.0% at the election), 37% Labor (32.8%), 7% SA Best (14.1%) and 7% Greens (6.7%). Incumbent Steven Marshall had a 46-26 lead over Opposition Leader Peter Malinauskas as better Premier. The full report from last week’s national Essential poll is now available. 51% (down two since December and down five since October) thought Australia is not doing enough to address climate change), 27% (up three and up four) thought we are doing enough and 11% (up two and up four) thought we are doing too much. The biggest decline in not doing enough since October was with Coalition voters (down 11 to 34%). In a question on trust in institutions, there were 5-7 point improvements since September in trust in state parliament, federal parliament, trade unions and political parties. There were 3-4 point declines in trust in federal police, the High Court and the ABC. Police were on top with 66% trust, with the ABC trusted by 51%. Despite a seven-point improvement, political parties are still last on 22%. In the wake of the far-right terrorist atrocity in Christchurch, there has been much condemnation of independent senator Fraser Anning’s anti-Muslim comments. Anning won just 19 personal votes below the line, so how was he fairly elected? The whole One Nation ticket had over 250,000 votes or 1.19 quotas in Queensland at the 2016 federal election. Pauline Hanson was immediately elected, and her surplus was passed on to One Nation’s second candidate, Malcolm Roberts, who had just 77 below the line votes. Roberts was then elected on strong preference flows from other populist right parties. When Roberts was disqualified by the High Court in October 2017 over Section 44 issues, his seat went to Anning, One Nation’s third candidate. From March 12-14, there were several key Brexit votes in the UK House of Commons. I reviewed these votes for The Poll Bludger. PM Theresa May is threatening hard Leavers with a long Brexit delay if they don’t vote for her deal. The last paragraph of the linked article about polling is out of date. 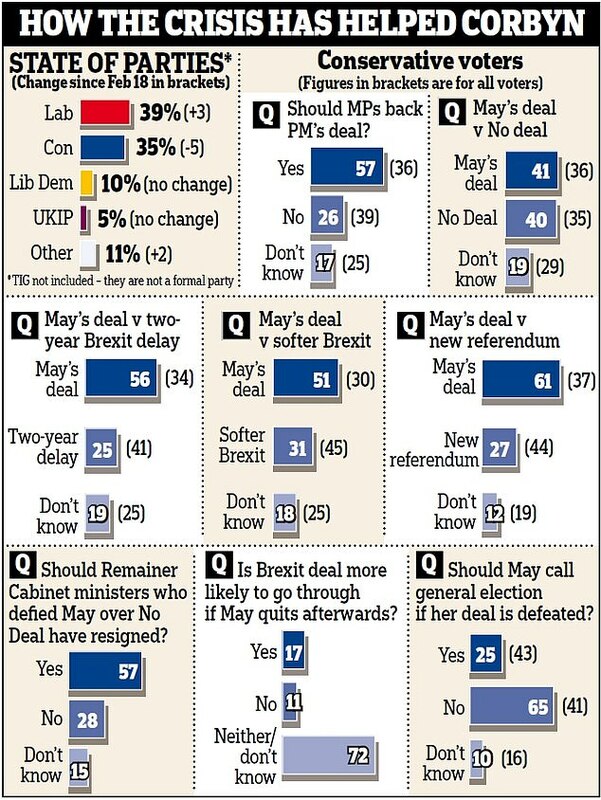 A Survation poll for The Daily Mail taken March 15 – after the Commons votes – gave Labour a 39-35 lead over the Conservatives. This poll is currently out of alignment with other polls.